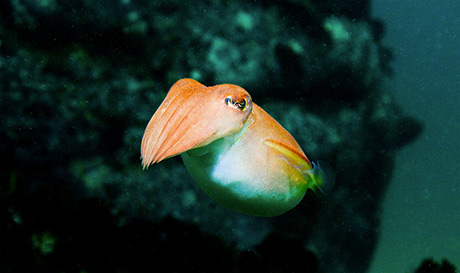 Hello and thanks for subscribing to SCUBA News. We send this newsletter every month and I hope you find it useful. We are also planning to start sending a newsletter which offers large discounts on diving in great locations. If this is not something in which you would be interested please let me know - email news@scubatravel.co.uk. Save $700 on Maldives Liveaboard this December! The Princess Haleema liveaboard visits the marvellous dive spots of the South and Central atolls of Maldives - perfect for those who like to dive with sharks. Book now for diving this December and save 42%. Which squid are OK to eat? Essential information for your trip to Indonesia - tipping, visas and, of course, the diving. The Sultanate of Oman is the oldest independent state in the Arab world. Tourism is on the rise, with diving being one of Oman's main attractions. There are up to 1500 different species of fish to be found in the coastal waters of Oman. Where to stay in Dominica? 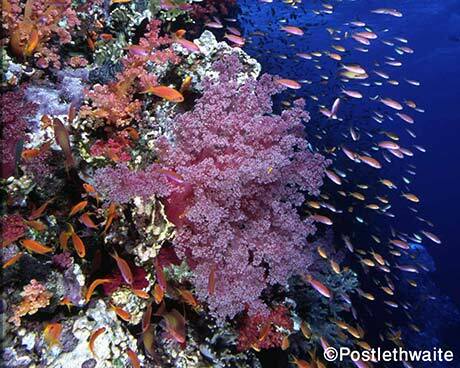 The best diving in Dominica is nearly all on the Caribbean side of the island, so that is where to base yourself. See where divers recommend. Travel insurance with no depth limits plus kit and technical diving insurance. Book up to a year in advance with code SD10. Where to dive in the Andaman Islands? For the best dive sites in the Andaman islands, is it better to go to a resort in Chidiya Tapu or Havelock? Have you stayed in India's Andaman Islands? What did you think of the diving and your resort? E-mail news@scubatravel.co.uk. Where once the prawn cocktail was a staple of the restaurant starter menu, calamari has now become a diner's favourite. Stewed, fried, in salad or dried with coconut milk, squid has spread its tentacles across the menu of many high street restaurant chains. Its rise in popularity has led the Marine Conservation Society (MCS) to increase the number of squid ratings in the latest version of its sustainable seafood advice - the Good Fish Guide. Squid stocks are thought to be as much affected by environmental pressures as fishing pressure, but fisheries still need to be well managed. Landings of squid worldwide have been increasing in recent years, and the MCS says that despite squids' high growth rates, short lifespan and other favourable fishery characteristics, some precautionary management is needed. "Japanese flying squid gets a score of a 2 which means it's on our 'Fish to Eat' list'", says Bernadette Clarke, MCS Good Fish Guide Manager. "This is generally due to the highly selective and low impact fishing method known as jigging used in the fishery and the fact that stock assessment has been carried out. There's also a low vulnerability score for the species, and management measures are applied in the fishery." A jig is a type of grappling hook, attached to a line, which is manually or mechanically jerked in the water to snag the fish in its body. Jig fishing usually happens at night with the aid of lures or light attraction and can happen on an industrial scale depending on the number and size of boats and number of jigs involved. Homboldt squid fished for in the East Central Pacific is not as sustainable and should be eaten only very, very occasionally. 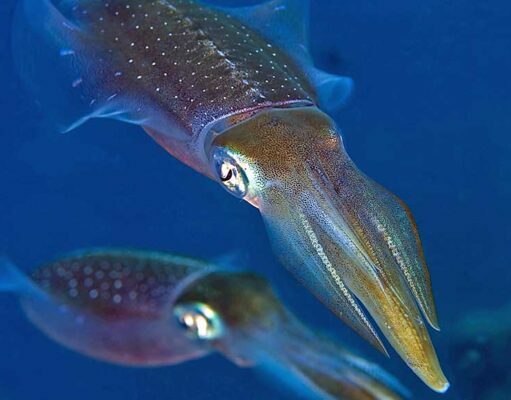 This species is one of the most heavily fished squid species in the world and because fisheries occur on the high seas and are accessed by several countries their management is complicated by the occurrence of Illegal, Unregulated and Unreported fishing. Purse Seine and pelagic trawling for squid use big nets on an industrial scale. The trawls commonly contain small meshes which capture protected species such as sharks, marine mammals and turtles and small sized and juvenile fish species referred to as "trash fish". 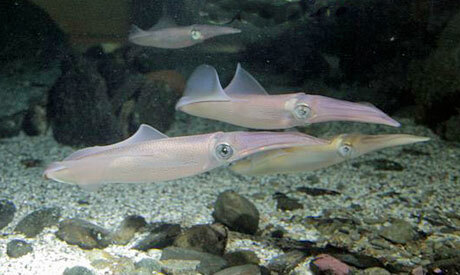 MCS says its advice is to choose squid from fisheries using low impact methods like small-scale jigging. "There's one such fishery in Sennen Cove, Cornwall, where fishermen go out in small punts and fish for squid using jigs," says Bernadette Clarke. "Fisheries in UK waters tend to be small, seasonal and non-targeted." Argentine shortfin squid is a short-lived and fast growing species, yet it is a very valuable predator and prey for a wide range of species including: fishes, seabirds, sharks and marine mammals. The fishery is the second largest squid fishery in the world with catches ranging between 500,000 and a million tonnes. The vast majority of the catch is taken by large (over 50 m) jigging vessels from several countries. As a result, coordinated international management is needed to manage the fishery sustainably, but this has been lacking since an international agreement between the Falkland Islands and Argentina broke down in 2005. This has led to overfishing in recent years. Squid - the Prawn Cocktail of the 21st Century - but is it OK to eat? Robot mussels have the shape, size and colour of actual mussels, but have miniature built-in sensors that track temperatures inside the mussel beds. Known for its long whip-like tail, the threatened Thresher shark is among a number of marine species given extra protection at the recent Cites meeting. Devil rays and Silky sharks have also been given additional safeguards. Finprinting uses the unique contours of a shark's dorsal fin as a biometric - rather like a human fingerprint or iris. Distinctive sperm whale dialects reveal that the animals now swimming around the Galapagos Islands belong to clans that are totally separate from those that were around 20 years ago. Warning signals that deter minke whales from wind farm construction sites are being tested in Iceland. It's the first time such acoustic deterrent devices have been used for this purpose. With an estimated lifespan of 400 years, the Greenland shark has just been reported to be the longest-lived vertebrate on the planet. In-depth examination into global seafood fraud shows that it is still a serious problem, hurting consumers' health and wallets, and threatening marine wildlife and ecosystems.